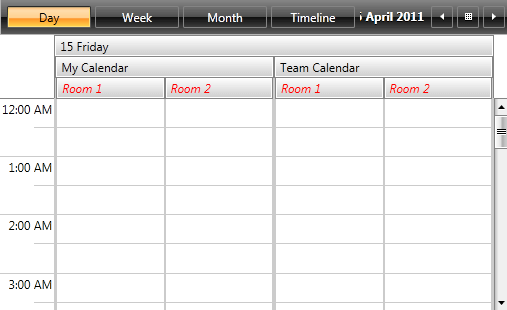 It is a common scenario to use resources in RadScheduleView and group the appointments according to the resource they are assigned to. This article discusses how you can customize the GroupHeaders. 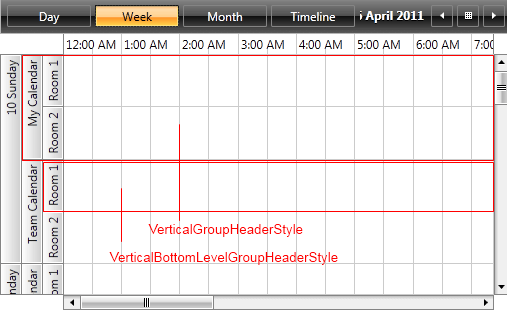 It also explains the use of RadScheduleView's GroupHeaderStyleSelector property in order to apply separate styles to the GroupHeaders. 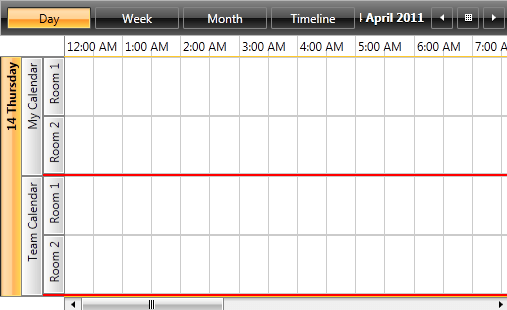 For the purposes of this article, we will use the following RadScheduleView grouped by Date, "Calendar" and "Room" resources. 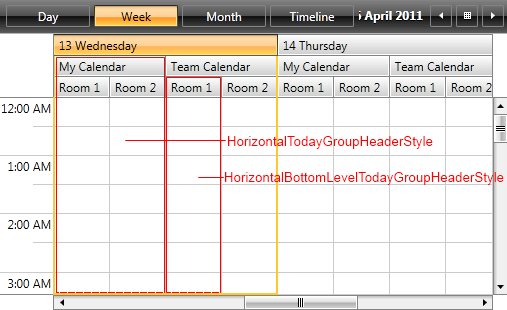 Example 1: RadScheduleView grouped by Date, "Calendar" and "Room"
Any change on the appearance of a GroupHeader depends on the GroupHeaderStyleSelector class and its containing styles. The selector is oriented, meaning it contains orientation-dependent styles – horizontal and vertical. In the UI for Silverlight installation folder on your computer, go to the Themes.Implicit folder and select the theme that you use in your application. Drill down to find the Telerik.Windows.Controls.ScheduleView.xaml file in that directory. From this resource dictionary you can extract the GroupHeaderStyleSelector and any needed resources that it uses. You can also generate the RadScheduleView template in Microsoft Blend by right-clicking on the control (either in the Design view or in the Objects and Timeline pane) and selecting Edit Template -> Edit a Copy. You should then search for the GroupHeaderStyleSelector and copy the style together with all needed resources that it uses. 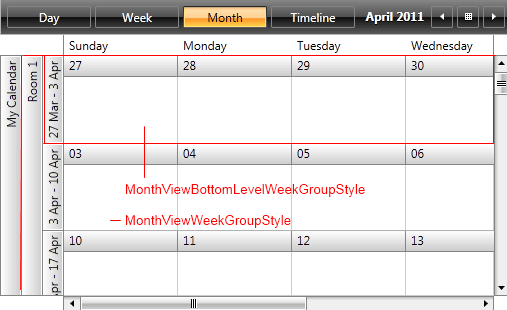 You can now modify the styleselector and set it through RadScheduleView's GroupHeaderStyleSelector property as demonstrated in Example 3. Let's modify the HorizontalBottomLevelStyle and observe the result. In order to set different styles for the different resource GroupHeaders, you should create a custom class which inherits from the OrientedGroupHeaderStyleSelector class and overrides its SelectStyle method. 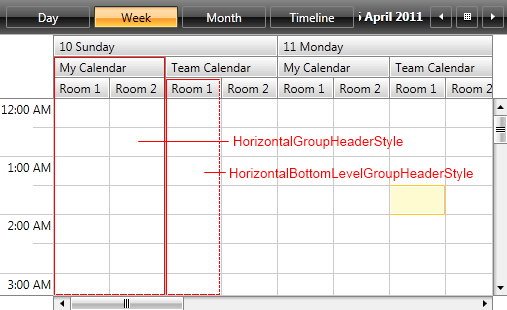 You also need to define Style properties for Date and "Calendar" resource headers and return the corresponding Style. 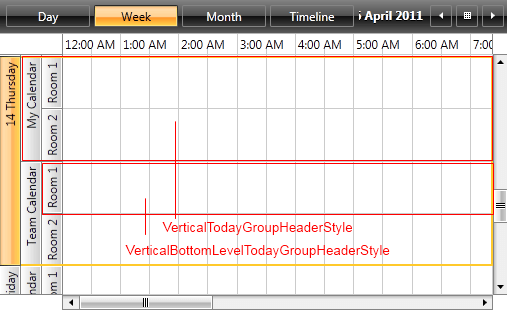 You then need to define the styles in XAML as demonstrated in Example 6.